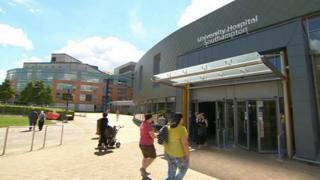 Security staff at Southampton General Hospital's A&E department are set to strike in a dispute over safety. Twenty-one employees of Mitie Security voted for a series of walkouts over what they claim is a lack of protective equipment and inadequate payments for staff injured at work. Union Unite said members would start an overtime ban and strike for eight days in April, May, and June. Talks are scheduled to take place with conciliation service Acas on 25 March. The union said staff were being attacked "on a regular basis" by members of the public, either under the influence of drink or drugs, or with mental health problems. It has called for personal protection gear such as stab vests and safety restraints, six months' full-pay followed by six months' half-pay for all sickness absences as well as "transparent investigations" into any attacks. Security staff are set to strike for 24 hours on 5 April, 19 April and 24 May. There will also be a 48-hour stoppage starting on 3 May and a further 72-hour strike on 7 June. A spokesman for Southampton University Hospitals NHS Trust said it was in talks with Mitie Security about maintaining security cover in the event of a strike. "Our organisation has a close working relationship with Mitie security staff and greatly appreciate the service they provide, so it is important to us that Unite and Mitie meet together and agree how this situation will be resolved," he added. A Mitie Security spokesman said: "We take the safety of our staff very seriously. "Whilst none of our security guards have been directly targeted, we are piloting the use of safety gear and regularly talking to our team on site about personal protection equipment."